While HMDA data have been a valuable tool in fighting discrimination and redlining and improving access to credit to underserved markets, there are substantial opportunities to improve the data collected to make it even more effective. One of the main limitations of the current HMDA data is the lack of sufficient information on underwriting and product characteristics. One of the major frustrations experienced when analyzing HMDA data is being able to document clear patterns that indicate discriminatory lending, but lacking the necessary data to prove that discrimination is occurring. This frustration has been compounded by the lack of action taken by regulatory agencies in the face of clear indications of discriminatory lending behavior. 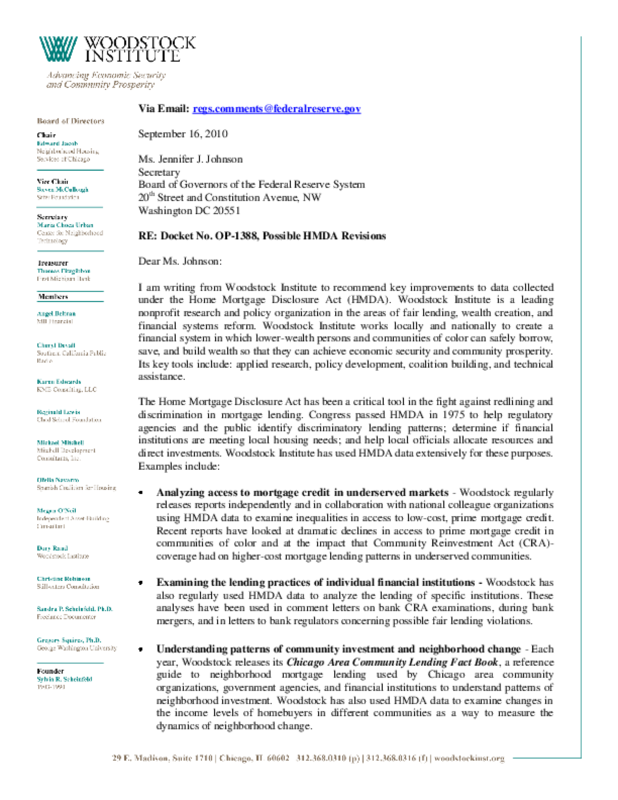 While the Dodd-Frank Act will add key data points that will solve many of these concerns, Woodstock believes that there is still opportunity to improve the data collected.